If you have traveled to anywhere considered “touristy”, then you probably already understand the woes of being a photographer who has too many people in the scene they want to photograph. Even if it’s just one person in your way, by the time that person leaves it is usually replaced with another (or more). The good news is, if the people are in constant motion (moving or walking around the scene), then you can set up your shot and use Photoshop to make them disappear! The first step here is to place your camera on a tripod, set it to Manual mode, and create several photographs of the same scene. Try to space them apart a few seconds, and if you have an in-camera intervalometer, that is a good way to set it up and let it create the frames for you. You need at least 10-20 images for this process to work well, and if you choose to you can include more. 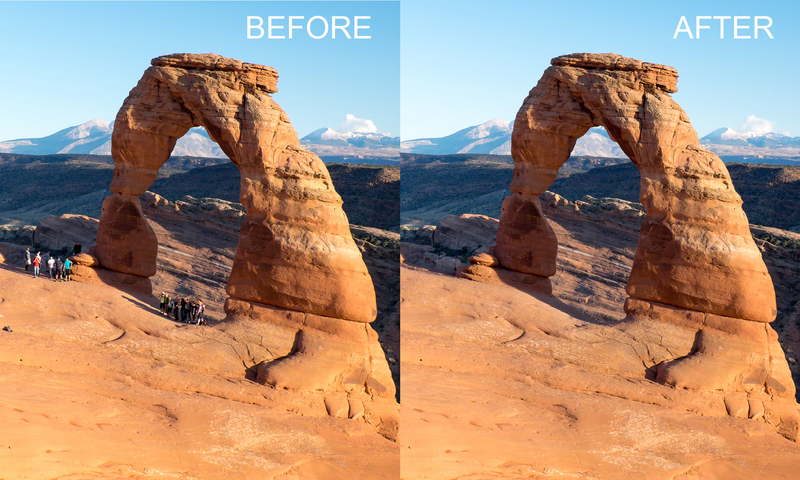 For this example of Delicate Arch in Arches National Park, I created 33 frames, each at 1 second intervals using a Fuji X-T1 camera. While inside of the Library module, select all of the photographs you are working with. Now, still using Lightroom, export the photos you just processed into their own folder. For this process, I will export the images at full resolution into a folder on my desktop. Step 4: Remove the tourists! At the top of the box, choose “Median” from the drop-down. Then, using the dialogue box, use the Browse button to select your photos. Check the box at the bottom that says “Attempt to Automatically Align Source Images”. Click OK and Photoshop will begin the alignment and “disappearing” process, and when finished the photo will open up inside of Photoshop as a single layered document. Odds are the previous step will remove most (if not all) of the people from your image. However, there might be some tourists who were not fully removed. This is probably because they did not walk around enough throughout your images, so they were seen as a part of the landscape. First, add a new blank layer above the layer you want to mask. Next, select the Clone Stamp Tool (or Healing Brush). In the Options Bar at the top, select “Current and Below” (or “Sample All Layers” for the Healing Brush). Clone out the area you want to remove. Now you have no tourists in your photo! lynda.com Learn photography anytime, anywhere, and at your own pacefrom bite-sized tutorials to comprehensive courses. Try lynda.com free for 10 days by visiting lynda.com/Photofocus. SongFreedom is about artists supporting artists. Were a music licensing platform with the best music availablestuff from the radio, or your favorite indie bands and soundtracks. A place where photographers and cinematographers can find the most powerful song for their story with the click of a button. Capture Cinematic Weddings with Ray Roman. A Wedding Workshop Series Traveling the US and Canada. Learn to shoot stunning wedding videos from the master of ceremonies, Ray Roman The World Renowned Wedding Cinematographer! Use the code PHOTOFOCUS for discounted tickets. I never knew this! Excellent, thank you! That is a nifty feature in PS. Thanks for sharing. Another tactic that I sometimes use to remove people or critters moving through a scene is to employ a Lee Big Stopper (ND 10) filter and a long exposure. It often works well if the people are in constant motion or only temporarily stopped. Of course this filter leaves a bluish tinge that has to be corrected in LR during post processing. I often use this approach when shooting a scene that includes a hiking trail nearby because sometimes you just don’t know when someone/something is going to encroach into the frame. It is strange that Adobe cannot explain the clear difference between modes: median, minimum, maximum – with sharp examples.